We're Not in Kansas Anymore: February 6, 1944: Argentina - Ally? Editor's Note: Thomas Doeppner, a student at Kansas State College, was for a short time with the United Press at Amsterdam. He is German refugee, and his interpretation of developments in the European war theatre carries the weight of his internment camp experiences in Nazi Germany, as well as that of previous years of travel on the continent. The Mercury-Chronicle each week brings you his interpretation of the war in Europe. Last week, the Nazis lost their last foothold in the Western hemisphere; Argentina broke diplomatic relations with the Axis powers. It had baffled many people for a long time just why Argentina did not take this step when the other South American countries did, but there were reasons. Economically, Argentina had strong and ancient ties with Europe. In the last year before Pearl Harbor, 74 per cent of her exports went to Europe, while only 13 per cent came to this country. Argentina's trade houses and ship lines were controlled or at least strongly influenced by European stockholders. Politically, Argentina has been rivaling with Brazil concerning the supremacy in South America, and, until just recently, Argentina had the upper hand in this struggle. When the war started; however, Lend Lease aid was given to Brazil, while it was refused to Argentina. This changed the situation considerably, and Argentina lost her prestige in South America. She was still strong enough, however, to maintain her pro-Axis position because of the aid she received from Germany. Germany's interest in Argentina is obvious. As long as Germany could break through the blockade, much badly needed material and food was bought from her South American "good neighbor," and Argentina was made to prosper by that trade. The center of German intelligence activities for the entire Western hemisphere was believed to be located in Argentina, and the vast number of arrests made by the Argentine police during the last few days seems to confirm this. Argentina also was an excellent listening post for things going on in the Pacific area. Germany was willing to pay as high a price for her Argentine foothold in the Western Hemisphere as she could possibly afford. It was mainly due to an excellent sample of Big Stick Policy that the United States finally succeeded in eliminating this Axis stronghold. 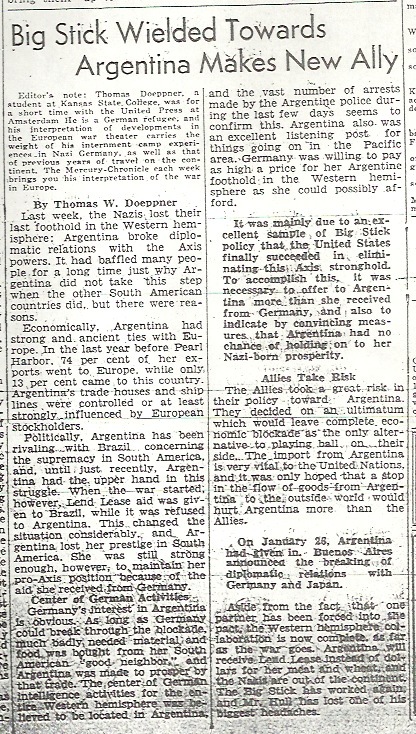 To accomplish this, it was necessary to offer to Argentina more than she received from Germany, and also to indicate by convincing measures, that Argentina had no chance of holding on to her Nazi-born prosperity. The Allies took a great risk in their policy toward Argentina. They decided on an ultimatum which would leave complete economic blockade as the only alternative to playing ball on their side. The import from Argentina is very vital to the United Nations, and it was only hoped that a stop in the flow of goods from Argentina to the outside world would hurt Argentina more than the Allies. On January 26, Argentina had given in. Buenos Aries announced the breaking of diplomatic relations with Germany and Japan. Aside from the fact the one partner has been forced into the pact, the Western Hemisphere collaboration is now complete as far as the war goes. Argentina will receive Lend Lease instead of dollars for her meat and wheat, and Nazis are out of the continent. The Big Stick has worked again, and Mr. Hull has lost one of his biggest headaches. I couldn't help but sing "Don't Cry for me Argentinaaaa" while reading this article. My first reaction to this article is that Argentina is acting super shady, and seems to actually have the upper hand in this political game. Everyone wants to have a friend in Argentina, and she is happy to let them pay for her allegiance. Here's the thing though, this makes Argentina like a mercenary- they'll go with the highest bidder. Or they'll play for both sides. 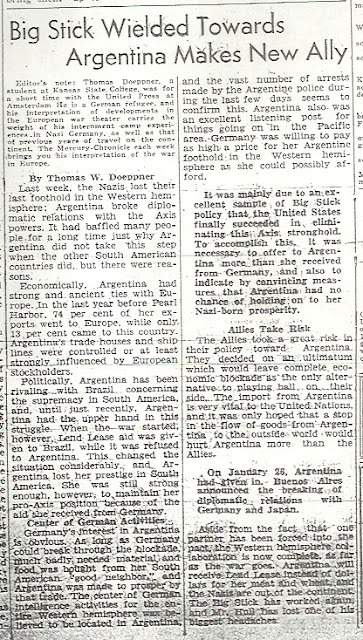 The insurance policy for the Allies is the ability to cut off trade with Argentina. Clearly, Argentina makes a fiscal judgement here. The Nazis are losing (slowly but surely) and the Allies are quick to point out that the Germans might not be able to be a high bidder for much longer. The Lend-Lease Act (read about it here you history nerds!) was basically a "put it on my tab" for any country who was willing to use the money for the Allied cause. The US did a ton of lending, but they also did some leasing too. For the US, this was in her best interest in terms of security and returning the world order to one amenable to the US. It was a very risky move (I think) and a big bill to pay, but it ultimately seems to have been the right move. This Big Stick policy Opa refers to is one named after Roosevelt's foreign policy habits, based on his famous quote "Speak softly, carry a big stick." Essentially, the phrase is about a morally justified bullying of a country or group to do what you want them to do. The US had some power to wield a Big Stick, and they needed Argentina to just stop being a thorn in their side. So- with the threats of a blockade, and promise of entry into this Lend-Lease contract- Argentina decides to cash in. Here is where I learn (am still learning) as a newly minted history nerd that moral absolutes do not have much of a place in political maneuvering. Is Argentina wholly "good" and does every citizen pledge allegiance to a free world under the example of the United States and other Allies? Not so much. They have not had a change of heart about who are the "good guys." They have a change of heart about which friend will benefit them the most. Winning a war, and getting ahead in any negotiations, often means just that: negotiating. Deals are made to make everyone happy, or at least to make the needs met. Argentina needed to have an economy- who cares who provides it. The US needed Argentina to close off the Western Hemisphere to Europe and Asia, who cares whether their intentions are pure. Maybe this is why people see politicians as so wishy-washy and sketchy: a lot of what they do behind the scenes involves bending and compromising to make things work. I like how the Argentine police force makes some arrests of Nazis after they officially join the Allied cause. I am fairly certain this was more a publicity stunt and less a real desire to rid their country of Nazis. In fact, I have read articles talking about Nazis being found in Argentina years later, and brought out of hiding in order to be prosecuted for their crimes. Argentina was a nest for Nazi activity, and that likely didn't completely go away even after they joined the Allies. This seems like a big risk for the Allies to give supplies and cooperation to a country who had been a headquarters for Nazi spies essentially. I'm reminded that there is always a LOT more going on underneath the surface, and I'm sure that there were eyes and ears everywhere. The Allies must have felt confident they could keep the Nazi spies/collaborators under their thumb. Argentina, you are an interesting country! I know embarrassingly little about South America and the history and politics of that continent. I'll have to do some more searching. In the meantime, my biggest take-away is that compromise can sometimes mean shaking hands while holding your nose. And sometimes that might be the best you can do.